Some clouds. Slight chance of a rain shower. Low 42F. Winds W at 10 to 15 mph.. Some clouds. Slight chance of a rain shower. Low 42F. Winds W at 10 to 15 mph. 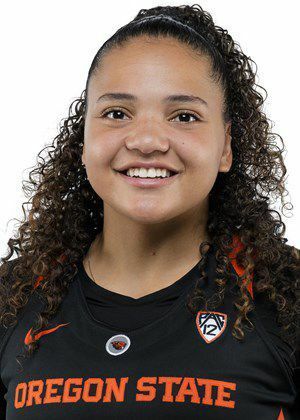 Oregon State's Destiny Slocum has scored 20 or more points in the last four game and on Monday the redshirt sophomore was named to the Naismith Trophy midseason team as well as the Lieberman Award top ten. The Naismith midseason team consists of 30 players from seven different conferences who are in the running for the player of the year award. The Lieberman award goes to the top point guard. Slocum is averaging 16.9 points per game — she has 11 20-point games — and has 120 assists in the season. She has also been named to the Wooden Award late season and Wade Trophy watch lists. There may not be a more potent offense in the country than the one the Oregon State women’s basketball team will face on Friday night.